Anneka Rice makes an appeal on behalf of the Riding for the Disabled Association, whose horses help people with disabilities all over the UK. Browse content similar to Riding for the Disabled Association. Check below for episodes and series from the same categories and more! to tell you just how impactful their work is. 'to becoming a parent with her husband Nick. 'and within three hours of arriving at the hospital she was born. 'and her life was hanging in the balance. and breathing really, really, really fast. 'but the premature birth left her with a variety of difficulties. She was like spaghetti, she would just wobble and then tumble down. 'Amy's problems made it hard for her when she started at nursery. 'She didn't start to walk, she didn't start to talk. "What was he to do?" 'She was falling further and further behind her peers at nursery. the Riding For The Disabled Association is there to offer hope. can really benefit from time spent with the RDA's ponies and horses. from the green field that was here yesterday! 'in a gritty corner of west London. 'a supporter of the RDA ever since. Aw! Sister Mary-Joy, who set us the challenge 21 years ago. -We're still alive! It's a miracle. -Thank God for that, yes. And it's lovely to see Robbie... Hi, Robbie. -when we did that challenge. So, how could you sum up the benefits of riding for a disabled person? they're actually using their muscles. which are so important for strength and stability. and they're actually on the animal, then it will lead to confidence. 'The RDA have centres all over the country. 'Amy's school suggested she might benefit from riding classes. 'and she just beamed and something was working brilliantly for her. Her strength and her posture are just so hugely improved. 'and she fell all the time, and now she's much more stable. 'She can run, and she's starting to learn to jump. and she can have, you know, any future she wants. 'And horse riding can also become a lifelong passion. 'a condition that means she only has limited control of her limbs. 'the UK at three Paralympic Games, including London 2012. 'and seeing the backdrop of Greenwich Park. "Oh, no, I've got a job to do. Get a grip!" 'but it's been a long road to Paralympic victory. 'relying on walking aids and a punishing routine of physiotherapy. You know, at school it was quite difficult talking to other kids. I worried that they wouldn't understand me that well. I just fell in love with riding and horses. 'when I was on a horse. So it gave me the skill to really believe in myself. and being an elite athlete has given me so much in my life. 'started out riding with the RDA. 'But the aim of the RDA isn't just to create Paralympians. if it weren't for the RDA. -And there will be a high five for you! because they understand that horses have the power to heal. to many more disabled people. Please give what you can, and let's try and make this dream a reality. You can also donate £10 by texting SUPPORT to 70121.
and the whole £10 goes to the RDA. BBC Lifeline Appeal, writing "RDA" on the back of the envelope. 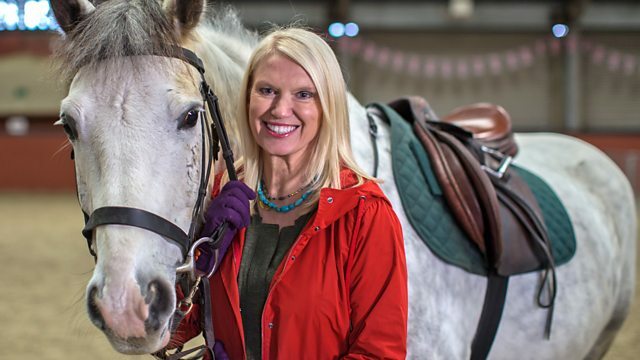 Broadcaster Anneka Rice makes an appeal on behalf of the Riding for the Disabled Association, whose horses and ponies provide therapy and enjoyment to people with disabilities all over the UK. Anneka first encountered the charity 20 years ago when she built them a riding centre for an episode of Challenge Anneka, and has been a supporter ever since. Amy Pendleton was born nearly three months premature. Amy survived her premature birth but doctors warned that she may have a range of difficulties which could affect her for the rest of her life. Her mother Sarah talks about how horse riding has completely transformed her daughter's life since taking it up at the age of four. Not only is she now able to stand and walk with much better co-ordination, her speech and concentration has also improved, giving her confidence and allowing her to thrive at school. The film also features multiple gold medal-winning Paralympian Sophie Christiansen, who talks about the debt of gratitude she owes the RDA. After she started riding with them, she made great strides physically and realised she had a talent which her RDA trainers helped her to nurture to great success.